Stay opens up with you meeting a person called Quinn in a room just doing some stuff, only when climbing into bed for the night a mysterious figure appears over him and knocks him out. Quinn wakes up to find himself locked away in a dark, damp bunker, with the only means of outside communication being a desk, chair, and computer with an internet connection sitting right in front of him. The downside to this computer is the only access it gives him is to one messenger window, with the person on the other end being you, a total stranger. Here you must get to know a little about Quinn, while also trying to work through chapters to find out how he got there, and also at times take control and help him through some puzzles that might give him an item he can use to try and escape from this horrible place. I think the one thing that made me grow to not really care about Quinn over time though were the puzzles the games throws at you every now and then, certainly slowing the pace down and at times making you just want to reach for the off button and take a break. They start out easy enough so it's not like instant tough, but as soon as you hit chapter 11 and a brick wall things sort just go harder and harder from there. I get the point of the game going for the whole "hitting a brick wall" metaphor it goes for midway through the game, only it actually makes you feel like hitting a brick wall literally, seeing me almost give up on the game and not go back. Took me a good couple of days before returning with my tail between my legs and guide video on YouTube to beat it. Something I hate to do on any puzzle game I get to play. Overall: Interesting concept and was both enjoyable but also massively frustrating at times, something that could totally spoil the game if it pushes you too far. 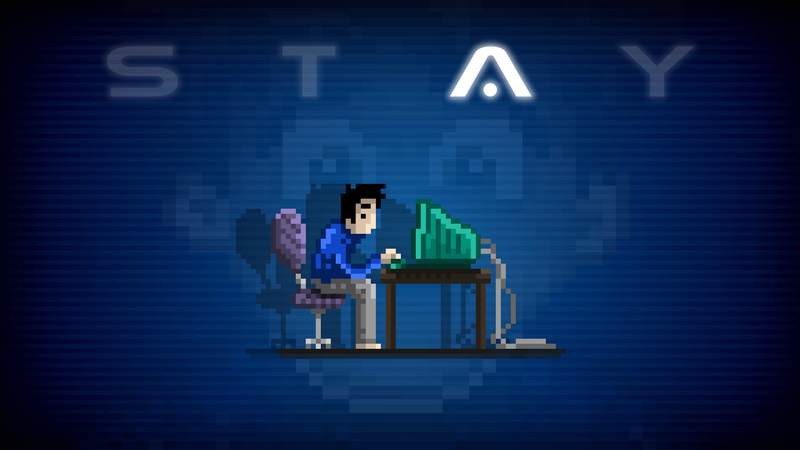 Stay is certainly a game that won't be to the taste of everyone, with those who will really enjoy getting to know Quinn and go through his story and being a brainbox with the puzzles loving it, while others will find the game somewhat dragging out with text, and with puzzles that can be really frustrating at times. The game does offer a lot of replay value if you can put yourself through this text-heavy experience multiple times. With the game having seven different endings, nineteen rooms, and fourty four objects to find, something you will need to do if you hope on maxing the game out in terms of achievements. I thought this would be a "Marmite" game when I heard about the concept. Didn't realize that he knew how long you'd ignored him for. That's a nice little touch but it seems they haven't built a character that you care about enough to really want to save him. A case of "great concept, poor execution" maybe?